I was about to put chili on the menu again last week, but then realized it had been a long time since we'd had a nice big pot of beans and rice. Matt noticed there were a couple chorizo links in the freezer, so we decided to add those too. Other than cooking the bean, this is a one pot meal. 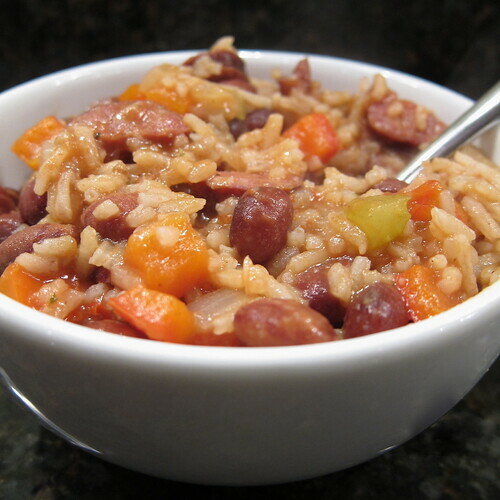 The rice absorbs wonderful flavor from being cooked in the bean cooking water, red peppers and liquid from the tomatoes. Yes, you can use canned beans, but then I might add some chicken stock with the rice for a little more flavor. Rinse and sort the beans. Put into a pot or crock pot an add 4 1/2 cups water. If cooking on the stove bring to a boil. Cover and reduce heat. Let simmer until the beans are tender, 3 - 4 hours. If using a crock pot, set it to high and cook the same amount of time. Add more water if it looks dry while cooking. Set aside. Do not drain. In a large pot like a dutch oven, heat the olive oil over medium-high heat. Add the peppers, onion, garlic and celery. Sauté until the onions are translucent and everything is tender. Stir in the chorizo, paprika and parsley. Add the rice and cook for one minute. Add the beans with cooking water and the tomatoes. You want there to be a little more than 2 cups liquid (just eyeball it). If you need a little more add some water. Bring to a boil. Cover, reduce heat and let simmer for 20 minutes until the rice is tender. Taste for seasoning. Add salt and pepper as needed. Serve with hot sauce if desired. Makes 6 servings and is really good reheated as a leftover. I am all about the one pot meal, this looks super. I'd love to warm up to a bowl of this. i didn't expect to see celery in there, but it's a great touch! Great idea! Despite the warm weather I have a feeling a few cold, comfort food days are in store for us yet this winter.